Affordable Accoutrements: Tablescape with Velvet & Lace! 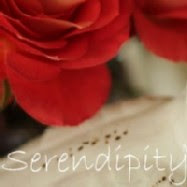 Thank you for the kind, generous comments and e-mails I've received from so many of you during my hiatus from blogging. It was nice to have a break, but even nicer to be back this week with a post for Tablescape Thursday with Susan of Between Naps on the Porch! I honestly thought my "Taking a Break" post might receive a half dozen comments at most. I assumed I'd lose followers and that readership would plummet. I just checked and found that hasn't been the case at all. Thank you for your patience, loyalty, and friendship. It seemed to me that I needed to do something a little different this week, but what? I heard an artist say once, "It's easy to learn to paint; figuring out WHAT to paint is the hard part." Perhaps it's the same with writing, cooking, and table setting. Where do you find inspiration when it comes time to set a table for a special occasion? For me it's a process. Obviously we don't exist in a vacuum. We see tables in restaurants, at fundraising events, at dinner parties, in films, on the pages of magazines, and (imitation being the sincerest form of flattery) on the blogs of people we admire. Sometimes inspiration for a table setting can begin with a new purchase, flowers blooming in the garden, a walk through the woods, a holiday -- possibilities are almost endless. Enough of that! I have a feeling most of you are ready to get on with the show. I know I am! Here's "Velvet & Lace" (presented with limited interruptions for commentary). About a week ago, after a rainy afternoon, the temperature dropped to freezing. Snow began to mingle with the raindrops around 9pm. Here's what I saw early the next morning. The street was glazed with a thin layer of ice, but the driveway and sidewalk were mostly merely wet. The streets were clear shortly after the sun came out. It was a wet, heavy snow. I thought it looked beautiful clinging to evergreens and bare tree branches and sitting atop black, metal objects. And on the lawn jockey's cap, nose, and shoulders. It seemed to me that the snow created a lacy effect on the network of twigs and the intertwined vines on the arbor at the entrance to the sunken garden. So what does this have to do with setting a table? Inspiration of course! No, not for this rather austere-looking table (which looked even worse without the neutral tablecloth). Why are these modern, blonde wood chairs in the dining room? And where are the dark ones that go with this table? And where is the oval table that normally lives in the sunroom? Here they are! In the den, currently staged as a dining room. Still life paintings I did a few years ago as demonstrations seem appropriate for a dining room. The one on the right was inspired by a Helen Van Wyk lesson on backgrounds. The one on the left is from a still life I set up and photographed at home (and taught a class to do in a one-day workshop). I'm using one of my favorite china patterns, Concorde by Theodore Haviland. I recently purchased the cream soup bowls & underplates at Pastimes Antiques, a 10,000 square foot mall in the historic riverfront area of Cape Girardeau, Missouri. Their website is HERE. There are approximately 20 places to shop for antiques and collectibles in the immediate area. Most are in walking distance of Pastimes. If you're in the area, I hope you'll stop by and meet Deb and her friendly staff. A closer view of the china. The napkins are from Belk. I used plain, silverplated napkin rings accented with black tulle and prism chains intended for a chandelier ($4 for a boxful at a local estate sale). Instead of using cut flowers, I purchased a houseplant -- a cymbidium orchid (reduced to $7.49 at Kroger!). The pot was wet, so I wrapped it in a plastic grocery bag, disguised with a napkin. The napkin is held in place with a rubber band. I wrapped it in black tulle to further soften the look of the plastic pot. It also helps visually tie the centerpiece in with the tablecloth. Champagne chilling on the bar. The flutes are from Goodwill -- Bohemian (Czech) Claudia crystal. They were inexpensive glasses even when they were new, but I like the sparkle of the diamond ball stems. Does it seem to you that the space has taken on the ambience of a traditional club dining room? 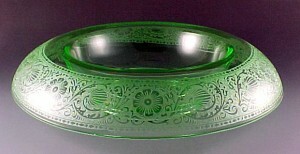 A closer view of the stemware. My favorite candleholders -- I've used them in many, many tablescape posts. "Old family" silver doesn't have to be costly (nor inherited). This round International Silver butler's tray was still in the box, wrapped in tarnish-inhibiting materials. It's a nice heavy weight. Want to know how much I paid? Would you believe $5 at a local estate sale? Often I'm the one helping bloggers identify crystal patterns, but I'm asking for your assistance on this one. I think it might be by Bryce, but I haven't found this particular design on this stem shape. Whatever the pattern, I love the way it sparkles against the black velvet and tulle. I cut appoximately one foot lengths of the black sparkle tulle (I didn't measure) and tied it (like the first step of tying a shoe, but without the knot). The slightly rough texture holds it in place. I started to tie the crystals on with narrow black ribbon, but ended up just draping them across the top. They could be tied on or semi-permanently attached with a few drops of hot glue if the intention were to use them this way frequently. The vintage silverplated flatware is "Eternally Yours" by 1847 Rogers Brothers. It's one of my favorite patterns. Introduced in 1941, I think it has timeless appeal. When I was browsing in Cape Girardeau antique shops, I was reminded of how vintage silver and rhinestone/crystal jewelry sparkle against a black velvet backdground. I like sterling silver of course, but I also like variety. I often think of silverplated flatware and serving pieces as good costume jewelry for the table. I freely mix nicer pieces with things like thrifted glass votive holders. I used platters for chargers at the end place settings (where I also obviously used non-matching chairs). I think mixing, rather than always matching, adds a modern touch and helps keep things interesting. A pair of chairs from the dining room stand in for the ones that usually sit next to the armoire. This room seems larger to me in this incarnation (and so does the sunroom, staged as a sitting area). One of my favorite tablescapes Susan of BNOTP has done was one next to a fireplace with a lace table covering sweeping onto the floor. That was certainly part of what inspired what I've created for you today. As usual, all is not what it appears. I don't own a lace tablecloth that could generously cover a table this size. I've used three vintage Quaker Lace cloths here. As I arranged the corners, I had an odd feeling. It was as if I were preparing a bride for her wedding photographs. Again, silver doesn't have to be expensive. This gravy boat caught my eye sitting on a shelf in a warehouse-like, unheated (other than a space heater next to the desk) thrift store in Cape Girardeau. Only $3! It was tarnished, but I looked it over carefully and felt for rough spots that might indicate silver loss. It was perfect. I look forward to using it to serve sauces or salad dressings at a real dinner party. The stemware came from a local estate sale. The "wine" is colored water. I included this shot because I liked seeing the reflection of the chandelier in the window. Another look at the flowers. I normally don't have centerpieces that touch the chandelier! I do think this could work for a dinner party, because (elevated by the glass compote) most of the foliage is above eye level. The gas logs give the room a warm, cozy feel. And now ... time to light the candles! Did you know the species Cymbidium hookerianum is considered a delicacy in Bhutan where it is traditionally cooked in a spicy curry or stew and called "olatshe" or "olachoto?" It is one of the most popular and desirable orchids in the world because of the beautiful flowers. These plants make great houseplants, and are also popular in floral arrangements and corsages. They have been cultivated for thousands of years, especially in China. Cymbidiums became popular in Europe during the Victorian era. One feature that makes the plant so popular is the fact that it can survive during cold temperatures (as low as 7˚ C or 45˚ F) [Actually they will survive at temperatures below 32˚F for short periods and even as low as 28˚F]. Orchid hobbyists in temperate climates appreciate the fact that they can bloom in winter, when few other orchids are blooming. I confess that I didn't know any of that (except that they could be used in corsages). What did we ever do without Wikipedia? I did say "limited commentary," and I've been chattering away. What can I say? I've missed blogging! Another confession: As many of you have probably noted, this isn't really black velvet. It's upholstery-weight corduroy. I looked at all the 54" wide fabric at Hobby Lobby and decided I liked this better than the velvets and the sueded cloth. I wanted something non-shiny, and this is machine washable. It was also quite inexpensive - $8.99 a yard. It was 30% off, and I had a $20 gift card I'd received as a Christmas gift. So I spent around $2 for a look that I think is unusual and, I hope, dramatic. I wouldn't bother hemming the sides for two reasons. Every centimeter of width is needed here, and I found the selvage -- or self-finished edges -- (selvedge in British English) attractive, with a slightly fringed look. I bought 3.5 yards, so there would be enough length to hem if I decide to use (and launder) it in the future. Well, actually it IS! Friends who have a standing invitation to dinner called and said they were available. What to do when the house is in tablescaping disarray? I didn't want to unset the velvet/lace table (hadn't taken the evening shots yet! ), and there would only be four of us. I flipped up the ends of the cloth and gave the table a "petticoat" -- silk drapery panels to cover the dark legs. I didn't do it very neatly, but the legs disappeared. I had just bought a box of clementines, so those went into the bowl for an impromptu centerpiece. I added a variety of candleholders and lit candle remnants I haven't quite been able to discard (which had the benefit of keeping the flames below eye level during dinner). The vintage Fostoria "Laurel" stemware came from the estate sale of a local judge. He was Al Gore's uncle so, naturally, I mentioned their provenance during dinner. I'm almost certain that Al and Tipper drank from these numerous times through the years of their seemingly perfect marriage. Well, they could have ... right? For fun, I served the deviled eggs on a kitchy ceramic tray. Pickles and olives are underneath the setting hen. Some of you have asked if I use Tablescape Thursday tables for entertaining guests. The answer would be, "Usually not ... but sometimes." What you see below is simplified, relaxed ... reality. I used easy-care cotton restaurant napkins, inexpensive acrylic chargers from Belk, and stainless steel flatware (also from Belk). The assemble-your-own salad was served on the kitchen island in plain white Crate and Barrel bowls. The chicken and rice stir fry (with lots of white wine both in the pan and poured in the glasses), I plated in the kitchen, on plates that match the bowls. There were homemade cloverleaf yeast rolls (just tossed ingredients in a breadmaker, and it mixed and did the initial rising). Dessert was served on clear glass plates. Coffee arrived with dessert (no cups on the table until then). Everything except the Haviland cups & saucers and Fostoria stemware went in the dishwasher. Easy and fun! But this is still the kind of table I truly enjoy setting for Tablescape Thursdays. If YOU were coming here for a dinner party, which table and room would you prefer? 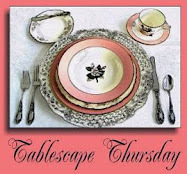 Please join the inimitable Susan of Between Naps on the Porch for Tablescape Thursday! Welcome back! You have been missed. Lovely tables and pictures. I have bought several books on stemware and depressions glass. Flatware is much easier. I like both settings and would be happy at either - although I do love deviled eggs. I am so delighted to see you back! I have missed you SOOOOO much, and this post did not disappoint. Of course, we want to hear you talk, are you kidding??? Loved all of the pretty accoutrements on both tables, but I am in love with the stemware of unknown provenance and name. That is just stunning. I so enjoyed this, Bill, and your tables just sparkle with life. You always have such amazing tablescapes to share with us? How often do you have dinner parties? I'm so pleased that you have re-joined us Bill! Both of your table settings are truly beautiful and I really wouldn't have a preference - I'd be happy to share a meal and friendship at either of them. I do like the black cord with the stunning white lace underneath, and may use the idea next time we have a dinner party...thinking about it with the addition of a little red it would make a lovely romantic backdrop for a Valentine meal for two. I can totally understand you, that at a certain amount of tablescapes one is exhausted on ideas. That's what happened to me and I do not have the time anymore to create weekly a new tablecape. Nor I have enough acessories for that. But I enjoy yours (as always). I love dramatic tablescapes and your look just as dramatic as if Scarlett O'Hara will came for dinner. I love your settings always and especially your Fostoria "Laurel" stemware is a eye-candy. Have a good time and I wish you (and us) lots of inspirations. Welcome back, Bill. Hope you've had a lovely break. The outside of your house looks as lovely as the inside. Your table is beautiful as always and the food looks yummy :o) Save a place for me, please, lol. Glad to see you and as the others have said, you never disappoint-unless you are gone! These two tables are so well done and so interesting. I love the "stories" behind your dishes and silver. As much fun as I think a dinner party could be with you, along with "Al and Tipper's sippers" I have to confess that my choice would be to dine in the paneled room. As I was reading and taking in every picture I kept thinking this is a scene from a Jane Austen book. AND once again I am so jealous that you find such wonderful deals on really good pieces. Beautiful tables...I would love to dine at either one, but prefer the last seeing I am a simple person! Your stemware looks like an unknown #147 miscellaneous cut from looking at the Crystal Stemware Identification Guide, page 340. Glad to see you posting again. You have created another masterpiece. Interesting info. about the orchid. I usually thought of them as being more fragile. Which do I prefer your ask? I could handle either one of those pretty table settings. Temps dropping fast - stay warm. I always love your tablescapes! Your set a beautiful table -- and either table would be fine as long as you're surrounded by friends! I've missed your beautiful photos, your lively commentary and your fabulous tables! Wow, I'd want to sit at the table with you, wherever that would be. The black is soo dramatic and elegant and so lovely. I am always the one at estate sales that scarfs up the silver. Most people don't want the upkeep. Glad you are feeling better, glad you are back. I loved seeing the cymbidium, my father-in-law had a orchid greenhouse and supplied everything from Dallas to the west coast, my favs were always the cymbidiums! $7.50 was a steal! I especially love your art work you share with us. Your table is something to which I aspire, love your china!! Bill, it's great to see you back. Your tables are sheer delight, both of them, and the commentary from you is always welcome. I've learned so many interesting things about china, silver, crystal, and other topics from your posts. I've missed you! Hope life is good and 2011 is off to a good start. Welcome back, Bill! You were missed...as was your inimitable style. Today's tablescape is gorgeous. I do love how you dressed the table with a variety of lace cloths...inspired! Like you, I use lots of fabric lengths in my table designs. My favorite fabric, right now, is burlap. I have been using it for years...and now I see PB and Ballard have finally caught up. (Just wish I could find jute fringe...)I love the texture from the jute...works well with my casual style. Welcome back Bill! We certainly missed you -- and you rewarded our wait with two gorgeous tables. I love the goblets in particular on the first one. Your candlelit tables are so gracious and elegant. The look is very dramatic. I love it....very rich and elegant! Ah such a dramatic grand return. I'd expect nothing less. Great to have you back! Thank Goodness! I thought I was going to have to come west and check up on you! I was getting worried! I have been needing my Affordable Accoutrements fix something terrible! I must say this tablescape was worth the wait. I loved the china, crystal, flatware, table coverings.....well, all of it. It is gorgeous, but I would probably be more relaxed at the more casual table. However, I would love to dine at your Velvet and Lace table. I love dressing up and going to fancy restaurants and your table would definitely require my fanciest duds! Welcome back, Bill. Don't leave us hanging so long next time! Well, well, well. Look who is here. Do you think you can just come waltzing back into our lives and pick up where we left off? OF COURSE YOU CAN!!!!! WELCOME BACK!!! I was trying to imagine all the different courses that would be served here. Mmmmm. The fun conversations around that beautiful table. You always use the most imaginative things to set your tables. Bill!!! Welcome back; you were missed more than you know. As someone else said, I was really needing a fix! We realize that you have a life away from tablescaping but, really, how important can it be?!? Seriously, I love both the tables and would be honored to dine at either. When I saw your new post, it was like getting an important invitation that you had thought might be lost in the mail! Your efforts are so appreciated and very inspiring! Bill, I really do like BOTH tables. I always love your formal tables -- so elegant, with china, crystal, and silver -- but I also enjoyed seeing a "real" table, set for real guests. I think you must have finely honed estate sale skills -- what marvelous items you manage to find! I'm so glad your back! it's always nice to take a bloggie brake though. I would choose to sit at the velvet and lace table, absolutely! I love to hear about your great deals at local estate sales, that tray for $5 is beautiful. The china is so delicate and paired with the lace it's just breath taking. thanks so much for posting such a beautiful table. Welcome back, Bro!! Hope you enjoyed your hiatus. Beautiful tablescapes... I don't know which one I'd prefer to dine at -- I will take either one, especially with a Chicken stir fry! ;) And Bill, I just LOVE all of your silver things. That's my favorite out of anything anyone can have, I love silver serving pieces. Oh, and your photos of your outside were beautiful. Love that arbor trellis. Well Bill it is quite a treat to have you back and show casing my very favorite pattern Haviland Concorde. My tiny starter set has grown over the past year & I have managed to pick up some lovely serving pieces. The different patterns of the silver charges really set off the gorgeous lines of the plates. You know I will be referencing this Post often just incase I missed something. Keep your inspirations coming . Lovely to see you again Bill..
A "two-fer"!!! I love it!!! Welcome back, Bill! The photos of the snow-laced landscape are beautiful. We got 12" dumped on us here in the Kansas City area yesterday and even though it's dangerous to drive in, I can still appreciate its beauty. The snow looked especially pretty on your arbor! The table is beautiful and inspired!!! That flatware...heavenly! I am still so happy for you that you are able to get such great deals at the Goodwill and estate sales! I swear this spring I am going to try to hit at least a few. AND what a great buy on the orchids! Everything is just gorgeous, and I'm glad to see you back. Have a safe and warm week! Oh...and Happy Groundhog Day! Wow, it looks fabulous. You know I love the cream soup bowls. Still haven't found any! And the velvet ;) is a great addition! Wow Bill, you truly out did yourself. Your table is over the top gorgeous, worthy of a magazine shoot.. the room is so warm and welcoming with candles lit and not... What an inspiration. OH BILL!!!! SOOOOOOOOOOOOOOOOOOOOOOOOOOO glad you're back! My little heart went pitter--patter! We missed you! This is gorgeous as always, both the lovely tablescape (the velvet is so divinely rich) that you did in the den (makes a great dining room to me!) and the outside winter wonderland, too!!!! I don't know where to begin commenting on your beautiful home tablescapes, china, stemware, decorations and setting...STUNNING!!! Boy, I've missed you Bill! Hope your OK now. I'm so glad you came back so incredibly...Next wendsday night I'm hosting a dinner party for 16 of our good friends and in the main dining room table I'll be using my white Noritake china and in the other 2 tables for four each, my Tognana. Anyway...I'm inspired for the white table in your gorgeous tablescape. I'm so glad you are back in action! The next time you get as far as Cape Girardeau ... you'd better cross the river and let me buy you a little wine along the Shawnee Hills Wine Trail in Southern Illinois! Thanks for sharing this beautiful post. You inspire all of us! We chose the same time to make our "come back!" You certainly outdid yourself with the dramatic entrance of gold and black velvet!! Absolutely gorgeous!! I came back quietly with more of a rustic look. Please note I did give you credit (way overdue!) for helping me identify my crystal! I am indebted to you for life for quieting my puzzlement about the name!! Now I won't have to go to my grave not knowing! LOL! I so enjoyed this marvelous tablescape! My oh my oh my!! Everything is so beautiful Bill! I am so glad you're back, you have been so missed! I would kill to be over there in the cool weather, it's absolutely boiling hot here. and ....I love your snow shots!! All's right with the world.....Bill's back!!! A truly elegant, beautiful table. Love every detail! Oh...I forgot to tell you in which table I wanted to dine. In your home, with you it must be a total experience in itself...but I choose the pompous one, with the black tablecloth! Thank you. So happy that you are back blogging! Missed your wonderful posts! These tables are both wonderful! We are lucky to get two for one tonight!! So happy you are back!! Welcome back! Love your "Winter Wonderland" exterior photo's and your beautiful tablescape is the perfect place for a warm cozy gathering of great food and friendship. Elegance to a T!!! Who cares if there is blizzard outside! BILL, I MISSED YOU SO MUCH, I JUST LOVE YOUR TABLESCAPES, IT GIVES US SUCH A WONDERFUL, WONDERFUL PEACEFUL FEELING, YOUR HOME IS JUST THAT,"HOME". My first visit and I think it's all magnificent! Welcome back to blogging. I love the dramatic look of your first tablescape - and the first blue hour picture is fantastic! The silver gravy boat was a fantastic find, but you already know that... I hope you'll stop by. I just posted my BEST tablescape ever! I've been wondering where you went, guess I missed your taking a break post.... This is undeniably the loveliest of all your lovely tables. I just love the way that crystal shines on the black background. You've found some real steals. Why is it that people aren't interested in silver any longer? I always find nice silver pieces at Goodwill. The Cymbidium is gorgeous and I love the way you elevated it in that crystal dish. WOW! What a glorious re-entry into tablescaping! So glad to see you back! I love the post. What a beautiful place to dine--and the blond chairs look great in that setting! I'm not a fan of mid-century furniture, but touches really can make a room special! Glad to see you again! Table Choice? I would love to be your drop-in guest at your casuel table, munching on a deviled egg and gazing at the Tablescape Table, a work of art! It is nice to see you back to blogging! This is a gorgeous table. I love the draping of the tablecloth and the napkins are perfect! So pretty! We have ice instead of snow...pretty now that the sun is shining, but it has been so horrible for travel and the power lines. I'm going to use that idea of a plant in a pretty container...love it! Wow, Bill, you are back in fine form. What a gorgeous post! Guess what?! Deb is selling me her set of Concorde. We are starting with a small box and doing it in 3-4 small parcels. I hope to get the coffee pot and cream/sugar first. Cannot wait. Indebted to you! I still promise to post about you soon, maybe when I get the first box of china! P.S. I didn't know you got snow like that in Tennessee! By the way, David is already picking out diners and dives for us to eat at whilst in Tennessee. We love Southern comfort foods! It's wonderful to see you back here in blogland! I don't even know where to begin with your tablescape. All I can say is it's simply elegant and stunning. The black "velvet" would definitely be my choice. I love how you draped the lace tablecloths. Just a beautiful table. Welcome back! I love the black fabric, and thanks for sharing that it's actually cordouroy (sp?). I thought it was velvet, and whined to myself that it wasn't practical for me. But, hey! Cordouroy is! And, I love the lace UNDER it rather than topping the black. Which table would I choose? While I'd be honored to be invited to sit at either table, my preference would be the table YOU are sitting at! Bill, this was such a treat getting to see two tables! Your home and gardens are just magical in the snow! I loved your lacey table! It was a magazine photo that first inspired the one I created in front of the fire. Your's is absolutely wonderful! Gorgeous crystal! I'd never want to leave that room! So cozy and beautiful there by the fire. Thanks for having us for dinner. Loved the first photo of the snow! It has such a pretty quality to it-love the formalness of the yews and then you have the trees whose shape just screams spring. Beautiful. As for the tablescape, what a lovely change. It has a wealthy monied look to it, as if dining in an estate or traditional library. Love the tablecloth, such a nice change from the pastel frou frou ones we often see in TT (Yes, I am guilty as charged, lol.). Love all of the silver and the china is quite divine. Oh, and I love the two dining chairs next to the small table; perfect for conversation. Looks like you haven't missed a beat since you've been off! Beautiful job this week.